Listen to our latest podcast, support our advertisers and support the show! Thank you! It’s lovely to have you hear. These traits are just a part of the sum of the Halli Casser-Jayne total. Throughout her professional career, Halli has worn many hats: reporter and photographer; actress and documentary producer; radio personality; author, editor and publisher. Her many accomplishments include writing and producing the six-hour rockumentary on The Doors as well as collaborating with Doors drummer John Densmore on his autobiography Riders on the Storm. She is the author and photographer of Still Life: Images of Antietam, and A Year in my Pajamas with President Obama, her celebrated book about the 2008 presidential campaign. As a foreign correspondent during the 1980s, Halli showed her fearlessness when she reported in the danger zones of war-torn Central America. Her frankness and feistiness have been expressed via her opinions and commentary on The Halli Casser-Jayne blog. As for fun and entertaining, Halli has hosted and interviewed a wide variety of distinguished guests from New York Times bestselling author Kristin Hannah to Israel’s Ambassador to the UN Danny Danon, to television personality, author, radio host, and anchor of “Lou Dobbs Tonight” on Fox Business Network, Lou Dobbs, to spiritual teacher Marianne Williamson, legendary comic, writer, producer Carl Reiner, Martha Raddatz ABC News chief global affairs correspondent and co-anchor of “This Week with George Stephanopoulos.”and three time Academy Award nominee actress Diane Ladd on The Halli Casser-Jayne Show. 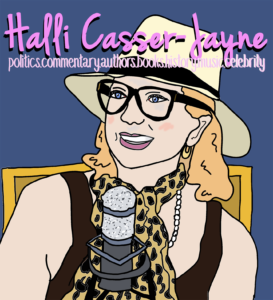 “I like to live open,” that’s what Halli says and listeners can get an earful on The Halli Casser-Jayne Show. The radio show is akin to the great salons of times past. Pour yourself a martini, grab a spot on your favorite sofa and listen to the great artists, writers, politicians, and celebrities of our day discuss and debate the current political and economic scene, art and music, film and literature or maybe talk about the newest trends in fashion, design and haute cuisine. Whether it’s the current political cocktail or the latest must-read award-winning book, Halli tackles all topics and likes to stir — and sometimes shakes — things up. Discussions flow freely and sometimes get heated, but they’re always fun. It is talk radio for the curious courtesy of Halli Casser-Jayne. Halli is available for speaking engagements!